First major museum field trip! We were given a section at the Lyme Regis Fossil Festival alongside a good handful of colleagues from around the museum. Our demonstrations were on 3D surface scanning and creating 3D images and prints within the Natural History Museum. But first, I had to get there. Had a bit of a hiccup Wednesday evening. I had already intended on doing half a day in the office and then heading back up to Chelmsford on the train so M and I could drive down. Unfortunately, either I straight up lost my season ticket holder or someone nicked it. Regardless, I ended up halfway to Liverpool Street Station via the District Line before I realised what had happened. Apparently if you come up to the station staff at the barrier gates with a concerned look on your face and tell them you’ve lost your Oyster card, they’re really pretty helpful. Greater Anglia, not so much. The lady at the desk was lovely enough, but unlike TfL they won’t just replace your lost/stolen card. Even though it’s a SmartPass and all the details are saved in the system that prove it’s me. They were kind enough to freeze the card and let me buy a single ticket home. Ugh. Thankfully, the monthly passes were both set to expire before I got back from travelling anyway, so that wasn’t too awful. Even better, my manager is a saint and let me work from home for the half day. Probably for the best, as we were definitely not packed the night before in any useful amounts. Eventually, the significant otter left the hospital and we packed up the car to drive the 4.5 hours to Lyme Regis. The drive was gloriously uneventful and we made it in around 10 pm. Everyone else was already at the cottage and set up, so we all caught up and then headed to bed. It was due to be a busy day the next day. The view from our cottage room Friday morning. Yup. Boaty McBoatface made an appearance. So many chips were eaten from here. Predatory seagulls, having a swim before their next attack. The eroding cliffside that is so famous for producing fossils. Walking on top of the sea break called The Cobb. A bit of the Austen book Persuasion was set here. It was a trip to the pub after the event wrapped up for the night and a game of skittles, then a slog up the 14% incline of a hill back to our cottage. (Views like that don’t come for nothing!) The next day was our busiest day of the weekend, and we went out in full force. We scanned objects from fossils to children’s wellies, and showed 3D images from microscopic to full size. The public engagement and honest excitement and interest was fantastic. We guessed from rough estimates that we had probably 230 people come and chat with us. There was a brief lull around lunchtime, probably due to the lovely weather and hungry children. That was quickly rectified though with an inflatable T. rex costume and a walk down the pier. People seem to want to know where a dinosaur and giggling museum staff are headed. Who would have guessed? Our freshly printed scale replica of a Diplodocus skull. Everyone wanted to put it on their head. The pasty is in incredibly good condition for being so old – it even still felt warm! You’ve not lived until you’ve been a dinosaur minder. Showing what just a quick scan can capture. Man, even I had fun on these. The grave of Mary Anning. Before we all set off for another trip to another pub for food, it was mandatory for me to go see the grave of Mary Anning. You see, Mary Anning was one of the pioneers in fossil collecting and helped to change the views on what prehistoric life even was. Of course, she was ignored in her own time, despite her accomplishments, and didn’t even get a grave to herself. Instead, she is buried with her brother. Still, she was a really interesting lady that you should read into if you have a free moment. She is the “she sells seashells on the seashore” inspiration behind the tongue twister! The evening was spent roving the town with my colleagues and M, eventually ending up at a party held at the house of a local fossil collector. I’m still not entirely sure how so many people ended up in such as small area, but it was a riot of a time. Because I am an old lady, M and I bowed out around midnight for home. Most of the rest of the crew didn’t come home until gone 2ish, from what I was told. And who says scientists are boring? It was throwing down sheets of drizzle all day, so having a nice walk at break time was a bit out of the question. At that point though, I was too tired and cold to want more than caffeine and dry shoes. Lesson learned for next year – prepare to get by on a lot less sleep than usual. At the end of it all though, we all cleared up the location and headed out for one last night on the town with the NHM crew. It was a lovely bonding moment for all of us, and I can see why people come back again and again to do it. I think I may need the year to recover, but it’d be good fun to go back again next time! Now hang on until next week and I’ll tell you about how we got in the car and drove straight for the coasts of the other end of the country. What are we kidding? There are probably children stampeding across the house because they’re about to have a week of holiday off school. M and I do not have any children, so this isn’t the case in our own home per se, but we do have a young nephew for whom it matters. In order for the whole clan to get together outside of Christmas, it’s easiest to do so on school holidays. Plans were made, and it was decided that we’d all go down to Padstow together. 5:45 AM rolled around on a Saturday morning and we were up and out the door from Chelmsford. We needed to meet the familial caravan of cars in the Cotswolds, which is why we were awake at such unholy hours. A visual interpretation of the mood felt at that moment. We drove straight through towards Reading where Mat wanted to get some breakfast. He swears it was because it was the first service station that was far enough from the M25 around London to avoid traffic. I suspect it may have been because I was reading all the roadsigns for cities and towns and spouting off information about Anglo-Saxon battles and medieval history and he needed to distract me. We arrived with time to spare and took a nap whilst the rest of the family gathered their belongings together and prepared to drive down tiny Cornish country roads. 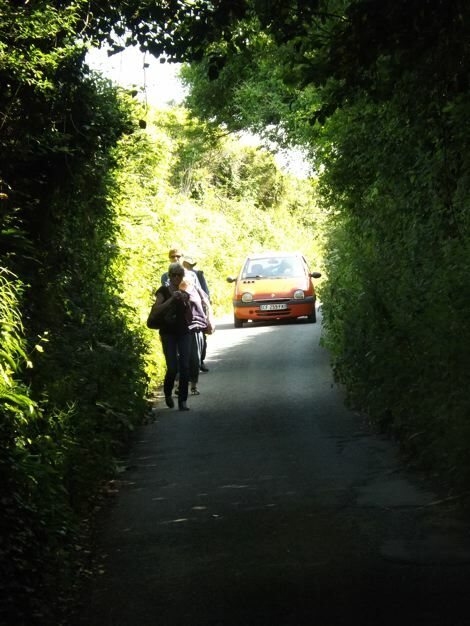 Before you guffaw and think it’s no big deal, you really need to google Cornish roads. Unless you’ve lived out there, it’s terrifying. Not only are they narrow and windy with blind turns, but the hedges are hiding the fact that stone walls lie underneath them. 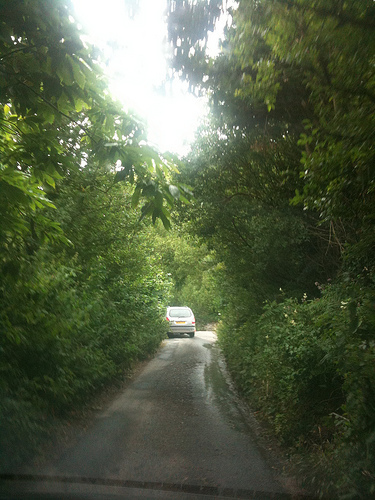 No easy brush with a bush in Cornwall, so drive carefully! We arrived after some of the clan at our cottage for the week. If you want something in the middle of it all, I’d recommend the Sail Loft. However, it is quite literally above a shop in the middle of the main pedestrian way, so be prepared to have some folks think you’re opening a shop door and try to follow you in the flat! Looking away from the harbour, right up the street from our rental. After everyone arrived and settled in, we all went out to dinner at Rick Stein’s Fish & Chips. It’s still just as phenomenal as I remembered it being! After driving over four hours to get there, we called it a night after food and headed home. The next day was Sunday, so of course we needed to go to a pub for a proper Sunday roast. Continuing our Rick Stein’s trend, we all headed over to his pub in the nearby village of St Merryn, The Cornish Arms. The food took a bit to arrive, but there was more than enough of it once it was there. On the way out I took a moment to dash across the country lane and get a few photos of the church across the road. There’s been a church there since before the Norman conquest, but the current building is post-conquest, at around 1260. I only had a few moments before my ride wanted to leave, but it made for a lovely scene. After lunch it was decided that an educational lobster tour was what was needed, so a portion of us headed over to see the National Lobster Hatchery. I was excited, as this was closed last time we were there. The hatchery has been open for 16 years and exists as a charity with focus on conservation, research, and education on the European lobster. Inside, we got to see the life cycle of a lobster, as well as current live examples in each stage. We even got to meet Anna, the blue lobster! This was all very exciting for the wee one in our group, who left with a plastic lobster grabbing claw and a host of new facts about lobsters to tell the rest of the group. Being an educational facility, they offered Adopt a Lobster programmes. It did say they’d ship your certificate internationally, so I adopted one for my mom’s classroom of primary school kids. Apparently they were over the moon about it and my mom had to give them lobster updates on a weekly basis for awhile. Best £5 purchase of the trip! It was a relaxed day afterwards with much mulling about and sampling of the pubs around the harbour. Ended up at home in a few rounds of card games, then suddenly it was morning again and we were off to St. Austell to tour the brewery. St Austell Brewery isn’t really a microbrewery, but I don’t think you’ll find them much outside of the UK. It’s a shame as the brews are phenomenal. You’ll find at least one variety at every pub in the area, and even back in Chelmsford we’ve been able to find at least some of their major labels. The brewery was founded in 1851 and has been running (with some modernisation) ever since. Their main beer is Tribute Ale, which accounts for about 80% of their sales. The fantastic part is that Tribute was originally made as a one off batch to commemorate the 1999 solar eclipse and was then called Daylight Robbery. It turned out to be so wildly popular that they renamed it and have permanently produced it since. They continue the tradition of special brews all the time, so who knows what might come out of Cornwall next? In honour of all our new knowledge, we of course headed to a pub when we got back to Padstow. It absolutely dumped rain in torrents all day, so most of the rest of the day was laid back. The next morning however, the rains had abated and the sun was shining beautifully. The weather just seems to do this in Cornwall – pelting rain or glorious sun, no in between. We all took the chance and got on the ferry over across the harbour to Rock, where we all had a stroll through the beachy sand and shrubs. Our shortest member of the group even braved a quick swim in the cold Atlantic waters. The rain clouds then started forming overhead, so we all made our way back to the ferry and back to Padstow for another relaxed afternoon. Deciding that relaxed days are no way to spend a holiday, we took that Wednesday as a chance to drive out to Tintagel Castle, along more of those exciting roads I mentioned earlier. The castle is a medieval fortification built by the 1st Earl of Cornwall in the 13th century. However, the island outcropping has evidence of settlement as far back as the Romano-British period. The site actually started as a tourist destination first in the 19th century, with archaeological excavations happening afterwards. In the 1930s these continuing excavations found the earlier Romano-British evidence in the form of a small high status settlement. This place has a long association with the legends of King Arthur. It was in the 12th century that the first mention of Tintagel as Arthur’s birthplace appears in the work by Geoffrey of Monmouth. In his story Arthur’s father, King Uther Pendragon, was disguised by Merlin’s sorcery to look like Gorlois, Duke of Cornwall, the husband of Igraine, Arthur’s mother. What all of this doesn’t tell you is just how sheer the cliff is and how much climbing of stairs and hills you will do to get to these ruins. It’s breathtaking (in more than one way) and totally worth the trip, but wear good shoes and pack something to drink. There’s a reason this island was such a great fortification site. And with this we pretty much reached the end of our holidays. We spent one more day enjoying the food and views of Padstow, then headed back to the busy East of England. Pros of travelling in half term: Get to see the whole family at once and spend time together. Cons of travelling in half term: The entirety of England also travels to spend time with their families at the exact same time as you. A predicted 3.5 hour journey turned into a 5 hour one.